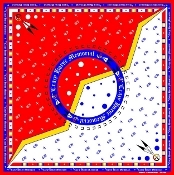 "Crazy Horse Dreaming" bandana was custom-designed for Korczak's Heritage and the gift shop at Crazy Horse Memorial©. The design was created by Melvin War Eagle, Oglala Lakota Sioux, of Handblechia Designs, a Native American apparel company, dedicated to designing and producing Native American Art. 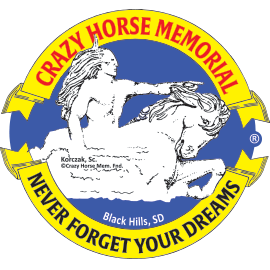 "Crazy Horse Dreaming" was based on a vision had by Crazy Horse involving the Thunder Beings. All elements of this design are symbolic to that gift given to Crazy Horse, shaping his life as a Lakota Warrior.